If you are pregnant, Congratulations! One of the most important factors of a healthy pregnancy and fetal growth is eating the right foods to get the right nutrition. Are there any wrong foods or bad foods for a pregnant woman? Are papaya and pineapple banned foods during pregnancy? Is it ok to eat ragi when you are pregnant? Should a pregnant woman eat only bland food without any spices? There are several popular beliefs that hold no water. 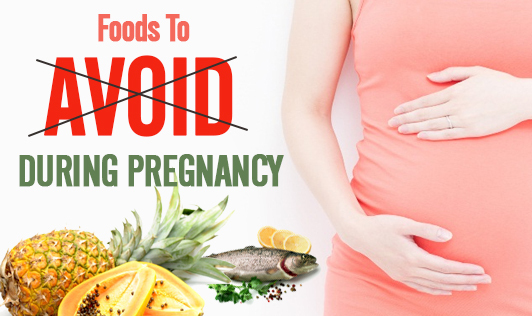 Most food items are not banned during pregnancy but some foods need to be limited. Alcohol is the only banned beverage during pregnancy. Raw papaya is also on the no-no list for a pregnant woman. Although this belief is prevalent only in some parts of Asia and has been scientifically studied only on animals, it is generally advised to avoid raw papaya. Unprocessed cheese and raw fish are also on the unsafe list. During pregnancy a low / no intake of unhealthy foods is preferred, and this refers to carbonated beverages, highly refined foods, high-caffeine items, unhygienically prepared foods and stale foods. A pregnant woman is allowed to eat a variety of foods from all food groups in the right proportions. The list includes all cereals (including ragi), all vegetables and fruits (yes, ripe papaya and pineapple are also allowed), all spices, condiments, nuts, fats, meats, dairy foods and dals. Consult our dietitian to help you with a well balanced diet plan during pregnancy.